However, when I run this against an instance with OpsWorks, this match returns nil, no matter what number the hostname has at the end. The OpsWorks agent version is the latest at time of writing (4023), using Chef 12.13.37. The run fails with type error no implicit conversion of nil into String. 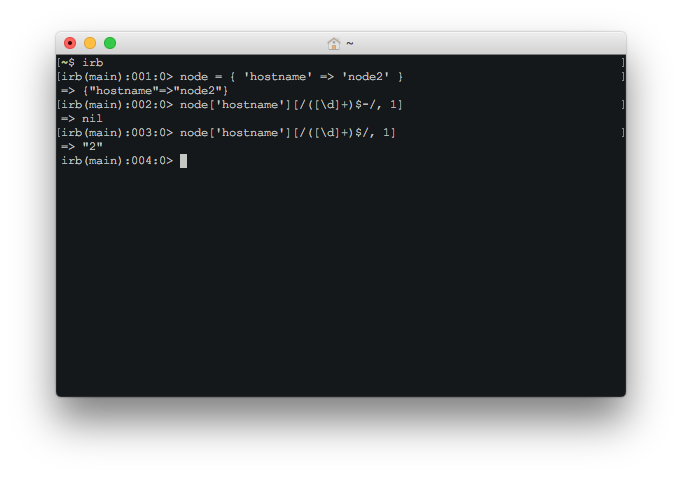 However, regex searches against that property work earlier in the recipe, when checking the node's number suffix. Is there a different method I should be using to extract the node's suffix? Edit: app['domains'].first is populated. This line still fails with the same type error if it is swapped out with domain.com. Judging from the cookbook code and the error message, the problem may be that app['domains'] is an empty array during the run. So you may want to verify that its value is correct. That second line ('irb(main):002:0') is what I copy/pasted from your cookbook code, the character is "\xc2\xad"
This is the only place this error would be raised because even if your String#slice returned nil you are calling to_s so it is an empty String but String + nil as would be the case if app['domains'].first is nil will raise this error.